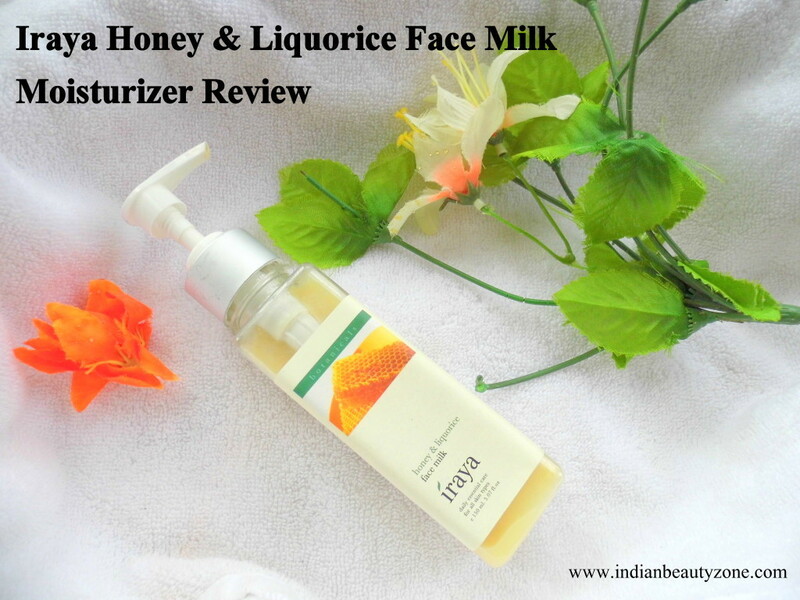 Honey and Liquorice Face milk nourishes and Protects with the goodness of Himalayan honey, liquorice and sesame oil, this delicious face milk nourishes and protects the skin. It gives skin a boost of essential nutrients and helps even skin tone, leaving the soft, smooth and radiant skin. Apply the Face Milk using fingertips, on face and neck and gently massage with smooth upward movements. Best to use after cleansing and toning. Can be used to sooth skin after exposure to the Sun. It is 100% vegetarian and not tested on Animals. Aqua, Liquorice, Priyangu, Banyan Tree, Honey, Sesame Stearic acid, Vegetable Glycerin, Glycerol, Fatty Acid Ester, CetoStearyl, Alcol, Borax, Pottasium Hydroxide, Citrus Grandis, Phenoxyehanol, Essential oils of Rose, Basil. This face lotion comes in a sturdy plastic bottle with a pump dispenser, if you close the pump dispenser you can carry it with you while travelling. It is a transparent packaging. The Colour of this face lotion is light yelow and it is very runny lotion in texture. This lotion smells purely herbal but bearable only. My skin type has changed from very oily to combination skin now a days, especially my cheeks behaving so weird now a days, but it is manageable by extra dose of regular moisturizer. Actually my problem is when I apply a moisturizer my T-Zone looks good and hydrated where my Cheeks looks bit tight and needs extra moisture all the time than the T-Zone. When I started using this Face milk as a moisturizer for my face, My cheeks also looks normal and hydrated like my T-zone. This lotion immediately makes the skin plump and hydrated. I can see the visible difference from my glowing skin. My dry cheeks feels very comfortable after applying this lotion, my Nose and forehead also doesn't looks very oily. This Lotion's texture is very light and it get absorbed into the skin in no time. I have used this face lotion when I return back from outside to indoor after a hot humid day. This lotion is really soothing and calming to my Sun burned skin. My skin felt really relaxed and energized. It is really a great face lotion those who is suffering by sensitive skin and very dry skin. It gives really a smooth and radiant skin by regular use. Sometimes I use to take bit extra amount of this face lotion and keep massaging it on my face to get relaxed facial skin. I have never faced any allergy or breakouts due to this face milk moisturizer. My skin is absolutely fine with this lotion and it is very useful for my sensitive skin. It is a herbal product. A little amount is enough for your entire face and neck. Gives a radiant and glowing skin by regular use. Goodness of Honey and Liquorice. Great for sensitive and dry skin. Very light texture that can be used under makeup.